CEO Worldwide announces a unique pricing model in the international headhunting industry. The new model offers regional low fixed and 100% success fees to companies seeking executives. “It’s time to shake up the old fashioned and costly cross borders head hunters market,” said founder Patrick Mataix. 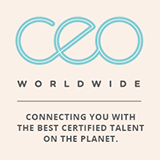 CEO Worldwide has completed more than 1,000 international executive searches since 2001. In response to feedback from their clients, they have introduced a new disruptive pricing model. They now offer regional low fixed fees and 100% paid on success fees without the use of a retainer. Why pay recruitment fees calculated as a percentage of the candidate salary? Why should clients be forced to accept the counter-productive “incentives” still in place today in the executive search industry? While other traditional international head hunters propose flat rates, CEO Worldwide provides new disruptive fixed recruitment and 100% success fees. Their pricing includes the option of very low fixed fees that are determined by their specific region. And their 100% success fee gives clients the ability to pay upon completion without the use of a retainer. This means that they will provide full contingency with no payment from the clients until the candidates have started their temporary or permanent role. *Fixed and success fees are invoiced only when the recruitment is fully completed (interim or permanent). Thanks to their unique expertise and positioning, CEO Worldwide is now able to link the worlds of interim management with executive search. Featuring superior flexibility and a response time of less than three weeks from initial demand to final placement, Management on Demand™ is perfectly tailored to the modern day constraints on most companies. Drawing from a pool of over 16,100 senior executives worldwide, each with a proven entrepreneurial profile, CEO Worldwide is able to offer managers who are prepared for local or cross border Interim projects that could turn into full-time positions in one of the 180 countries covered.